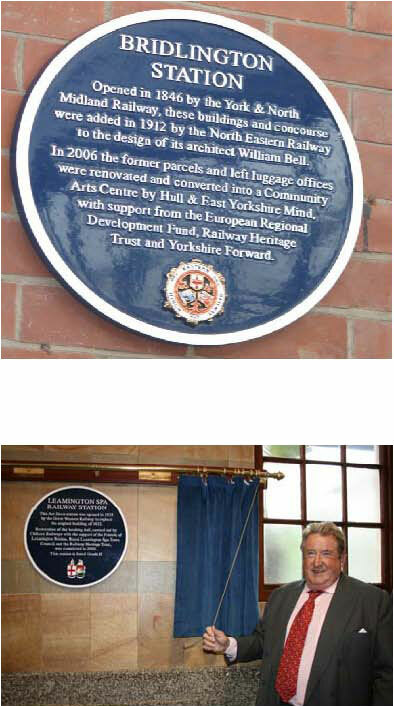 The Railway Heritage Trust supports the provision of plaques for selected locations, where significant works of repair and restoration have been carried out to historic railway premises and structures with the help of grant funding. The principles of the installation of plaques follow those agreed at the English Heritage Conference, ‘Commemorative Plaques: Celebrating People and Place’ held at the RIBA on 18th-19th February 2010. The basic original design for plaques has been agreed with Network Rail and the text follows the guidance document resulting from the conference. When the Trust specifies that a plaque is provided it will arrange design, supply and delivery. It will arrange duplicate plaques in Welsh for any supplied in the Principality. It can arrange direct delivery to the site, or to an event arranger for an unveiling ceremony. The Trust will offer guidance regarding location in an interior space where possible, such as a concourse or booking hall. Display of the plaques may require Listed Building Consent. The text identifies the premises or structure, its architect and engineer when known, the completion date of its original construction and its status as listed and/or in a Conservation Area. The text is prepared by the Trust, with expert advice where necessary from the National Railway Museum or other authorities. The coat of arms or heraldic device of the original owning company, or its nearest available equivalent or successor, is reproduced in colour on the plaque. This plaque is intended to be displayed for an indefinite period. 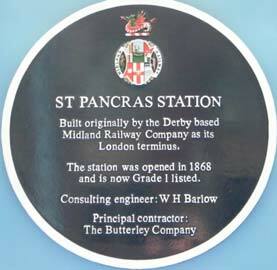 The plaques are 510mm diameter and cast in aluminium, with raised lettering, devices and borders, for concealed fixing. The finish is painted in dark blue BS4800: 20 C 40, with border and lettering in white; devices are produced in the correct heraldic and corporate colours.